Jack stand adjusts from 13" - 21"
Working on your own car has a certain satisfaction for both amateur and professional mechanics. You get to know the basics of your vehicle, which allows you to troubleshoot it when issues might arise. Aside from the basic socket wrenches in your garage, there’s another tool that’s necessary for your next vehicle project. Jack stands give you the ability to lift the car as you maneuver yourself or tools underneath it. You can’t just buy any stand, however, because there are many factors to consider. From the stand’s specifications to your car’s weight, these items must be carefully matched in order to keep you safe in the garage. Take a close look at the best jack stands on the market today before you slide back underneath your vehicle. 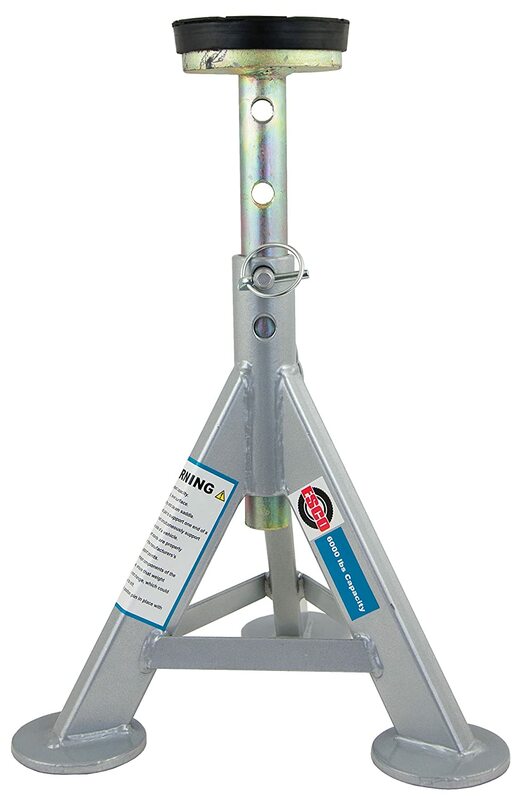 When you want to trust a jack stand, look for the 3 Ton model offered by ESCO. This product doesn’t have a fancy design, but it employs both circular and triangular concepts in order to hold your vehicle steady. In fact, many consumers report that this item is so sturdy that they trust it implicitly. When it comes to holding up several tons of weight, you need a product that’s well built. Take a closer look at the details that are inherent to this stand, and you’ll become a fan in no time. One of the first features that you might notice on the ESCO product is the adjustable height. Every vehicle and project has a different specification. This particular model adjusts between 13- and 21-inches tall. Ideally, you want to adjust the jack to a moderate height. Maintaining the height to around 15 or 16 inches gives the stand as much stability as possible. Although this item is rated as safe at 21-inches tall, try to use it at lower heights for the safest use. As the product’s name implies, this stand holds up to 3 tons. It’s normally sold in one-unit quantities, so keep this fact in mind when you’re trying to buy your stands. Each stand supports 3 tons, and you should have a minimum of two jacks holding your vehicle at any one time. You always want a product that will hold more weight than you need. Overexerting a stand will only compromise your safety and the product’s longevity. As you adjust the stand to the proper height, you aren’t limited to a standard, ratchet system. This unit comes with a through-pin design. Line up the adjustment openings, and insert the retaining pin. This pin will hold the stand in place as it supports any substantial weight. Most reviewers and consumers agree that a pin system is the best and safest design on the market today. The pin won’t release unless you pull it yourself. One concern with this ESCO product is the pin’s circular pull. It’s relatively small in diameter, which makes it difficult to grab if you’re wearing gloves. Try this stand out before you buy it. Slide your finger into the pull with your gloves on. Everyone has various hand sizes and glove styles. This pull might work for you but not for another person. The top of the adjustment pole is covered with a thick, rubber pad. Consumers praise this featured addition because it creates a protective area. When you jack up a vehicle, the pressure point between the car and stand will often be damaged with a traditional tool. This rubber pad cushions the pressure point so that no damage is possible. When you’re trying to preserve the paint on your vehicle’s underside, this stand detail is a major selling point. Gaze down at the three legs supporting this stand. They’re spread out to an ample diameter without being too wide. You don’t want a stand that will impede your movement as its legs get in the way under the vehicle. The feet aren’t basic squares or rectangles either. The manufacturer designed this product with round feet. The circular shape allows the jack to sit evenly on the floor. With the load distributed across the ground, the weight won’t force the stand to cut into the ground. Your garage, driveway or dirt pathway will barely reveal a mark after you remove the stand. Many jacks come with a sturdy design but poor construction. Take a look at the adjustable shaft, and you’ll notice that it’s solid. You don’t have a hollow tube holding up your vehicle. This solid, metal section is meant to stand the test of time. It will hold up 3 tons without any wobbling. In fact, consumers have reported that this stand is one of the most stable ones that they’ve found in today’s marketplace. If you plan on using the stand on a frequent basis, you can trust in this solid construction. You aren’t just limited to holding up your favorite car with this jack stand either. Consumers are creative, and they also use the stands for other vehicles. Add three or more stands underneath a tractor. Service those heavy-duty machines with ease. Simply match the vehicle’s weight to the number of stands. In the end, you’ll have more versatility around the garage or field than ever before. A traditional stand is found with the design offered by Torin. This Double Locking product has durability built into its construction. With one glance, you’ll know that this jack will help you out with almost any project. This stand has several key features that you’ll want to evaluate before deciding on a purchase. Explore them, and enjoy the professional design that Torin brings to all of their products. The first feature that you’ll notice is the sturdy base. It has four legs that culminate into 90-degree angled shapes. These legs will distribute the load with efficiency in mind. There should be no unstable issues when you maintain the load below the stand’s maximum capacity. You’ll also appreciate the bright-red design. Stands should be as visible as possible in order for you and passersby to clearly see them. No one should trip over these jacks because they’re so bright even in low-light conditions. Be aware that these stands come as a pair. Other products are sold as individual units, but Torin takes another approach. The manufacturer knows that you should be using these jacks in pairs so they sell them that way too. The load capacity of 6 tons is the allowable weight that can be distributed between the two stands. Using one stand will only support 3 tons, but this application isn’t suggested by the manufacturer. This product has a relatively good adjustment height that ranges between 15.5- and nearly 24-inches tall. Consumers report that they can work on their large trucks with ease when they use these stands. Other vehicles, such as cars, are easily held too. If you have a special application, however, you’ll need to read the stand’s specifications carefully. You never want to overload the support. This adjustable height is accomplished by the ratcheting system designed into the product. Simply toggle the ratchet, and you’ll move the shaft up and down with ease. In fact, you can move the shaft quickly or in fine movements. The ratcheting mechanism offers you a lot of flexibility with any project. When you reach the right height, secure the entire assembly with the locking pin. It will be nearly impossible for this product to slip with the double-lock system. If you take a close look at the stand, you’ll see that it has a welded construction. Many consumers report various opinions on these welds, however. Some people state that the welds are the best that they’ve ever seen, whereas other reviewers are concerned about poor connection points. Use the zoom feature found online when you’re looking at the product. Ideally, examine the stand in person before buying it. Make your own decision about the welds, and you can narrow down your purchasing options at that point. This stand has a solid handle, which contributes to its superior design. In fact, this handle is more than just a transport convenience. It’s also used as a column release. Quickly move the shaft downward with the handle, and then carry it to its storage area. Torin made sure that the handle was sturdy by avoiding a hollow construction. The solid steel won’t bend or warp even under the stand’s 30-pound weight. Smart designs make this jack a serious contender for any serious mechanic. Torin builds several jack stands that look similar in the marketplace. If you’re looking for a particular model with certain specifications, research your purchase through the model number. Torin uses a seven-digit model number that indicates specific jacks. From height adjustment to load capacities, the model number will guide you to the right product for your application. In third place is the Aluminum Stack product by Camco. Deemed the “Olympian,” this product has a sleek appearance with a silver hue to its entire assembly. This stand has a specific application, which should be followed as you decide between products. 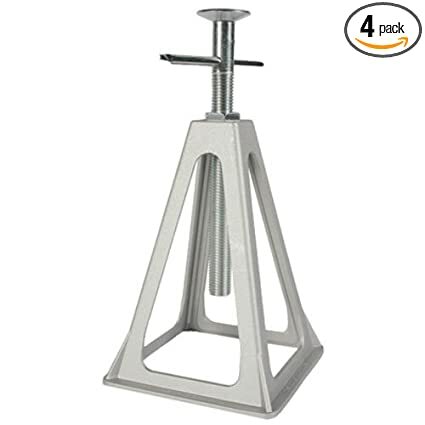 When you need a reasonable price on a set of four jacks, this Olympian package is a stellar deal. This product is made out of aluminum. It’s cast by the manufacturer, which contributes to its non-corrosive features. You’ll never deal with rust or other issues when these stands are used for long, time periods. The aluminum construction also gives you a low weight for each jack. Carry all four at once without any problems. Other models with a steel construction might be too difficult for some users. Each jack weighs in at a little under 8 pounds each. Although each one is rated for 6,000 pounds, some consumers are concerned about the stability of the design. Lightweight jacks are perfect for transport, but users report some issues with instability. RVs and other vehicles are actually wobbling under the stands. Try to match your item’s weight to the stands’ specifications. In addition, spread out the jacks under the vehicle so that the entire weight is even across the tools. Instability shouldn’t be an issue when the stands are correctly installed. Both the manufacturer and consumers state that these stands are mainly used for RVs. You might place them under a standard vehicle or trailer design, for instance. Many users add the stands for long-term use, such as a trailer being lived in while it’s parked in a driveway. In most cases, the stands aren’t used for car-lifting processes. You’ll need a different stand model for these instances. The adjustment range is wide on these stands, but it’s relatively low. The lowest setting is at 11-inches in height while it peaks at 17-inches tall. Consider your project’s details before using these stands. The adjustment height is perfect for basic lifting needs, but you may not be able to fit your body under the item in question. Keep this fact in mind as you shop for different products in the marketplace. You may be used to jacks with a ratchet or pin-through assembly, but this product uses the screw design. Spin the jack into place as the fine threads give you plenty of room to adjust the tool. Lock the tool into place when you’ve adjusted it to its perfect point. The screw assembly comes with a handle that slides within the main shaft. Access the handle from nearly any angle, and you’ll have no problem lifting your item. This old-fashioned design is still a strong selling point for jacks today. Each jack within this package supports 3 tons each. With all four products under one vehicle, you have the ability to support 12 tons. RVs should easily fall under this weight limit, which enables you to store or set up the unit as you see fit. Set up the jacks as described by the manufacturer, and you’ll have trusted tools for any project. When you really need a pair of stands that will serve you safely during each car repair, look for the 3 Ton models from Cartman. 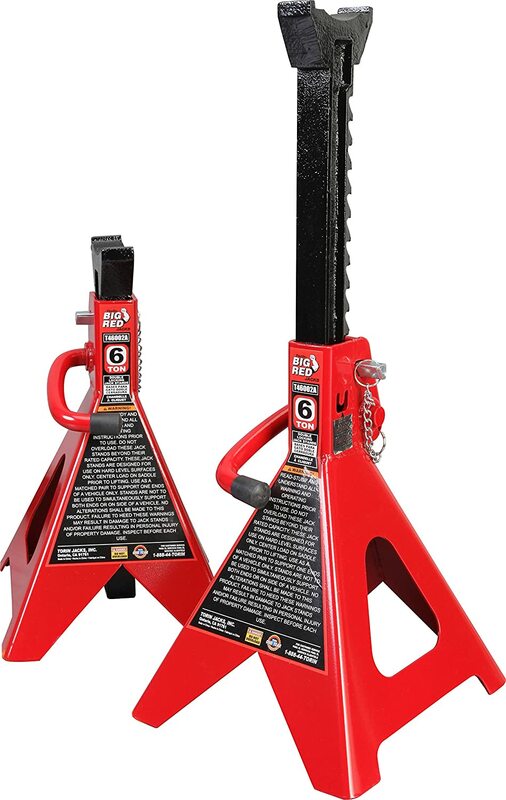 These bold, red jacks are basic items for any garage at a price of less than $50 for the pair. Although these stands don’t have a lot of versatility for those large projects, your basic car-care needs are easily served with this set. Before you make a final purchasing decision, consider this brand on a serious level. Consumers appreciate the ratchet bar that comes with these stands. They aren’t pieced together by the manufacturer. In fact, they’re constructed of one piece with flexibility to the metal. You can crank on this handle without any fear of cracking or breaking the mechanism. There is no pin-through design on this set, however, but the manufacturer created a modern, ratchet assembly that’s incredibly strong for most applications. A unique feature to this stand is the dolphin-tail supports. The fluke is in an upside-down orientation, which cradles the vehicle as its weight presses against the stand. This support shape also reduces any movement by the vehicle as it remains lifted above the ground. When you compare this shape to a flat support, this product wins by a far. You should note that this jack is meant for small vehicles, such as compact cars. Its lowest setting is slightly less than 12 inches. You can slide it under a car and lift it as necessary for an oil or tire change. Larger vehicles, in contrast, wouldn’t be properly supported with this product. There is some versatility in this stand because it can lift an item to about 16-inches tall. With this height range, you can physically slide under the engine and examine it as necessary. The sturdy stand gives you clearance for basic repairs without the sensation of being cramped in a small space. Some consumers note that this set is a bit difficult to piece together upon receipt. Bending metal tabs and hammering items together might be difficult for some users. Consider your talents when you decide on this product. It’s a low-cost item, but it will take some effort to put together. With the proper assembly completed, your new jacks will perform well for many repair sessions. When you’re looking for the most stable stand in the marketplace, select a model that has a pin-through design. This feature is part of the adjusting mechanism. As you change the height on the jack, you want each adjustment to be as stable as the lowest setting. Ratcheting systems are efficient and remain viable in the industry, but they can slip. A slipped adjustment can actually harm you when you’re underneath the vehicle. The pin-through system is slip free. Unless the pin in pulled from the hole, it cannot move from its adjusted position. If you spend a lot of time under a car, this safety mechanism should be at the top of your consideration list. Every jack that you put underneath your car is holding a substantial amount of weight. With that sobering fact in mind, it’s important to pick a stand that has a strong, material construction. Look for solid steel shafts with metal legs that support it. Hollow shafts are common for some products, but their structure might be compromised over the years. If you perform irregular work on your vehicle, an aluminum jack is sufficient for your needs. It will stand up to the vehicle’s pressure, and excessive wear won’t be an issue. Jack manufacturers must balance stability with a compact shape as they design their products. The item’s base shape is an important part to any stable, lifting process. Ideally, look for bases with a triangular shape. The triangle is one of the most solid structures in architecture. Although a square base is safe as well, it can still have some wobbling attributed to it. The base should also have a wide enough stance in order to stabilize itself under particularly heavy loads. No base shape can hold a load that’s past the product’s specifications, however. Always be aware of the vehicle’s weight before you lift it. 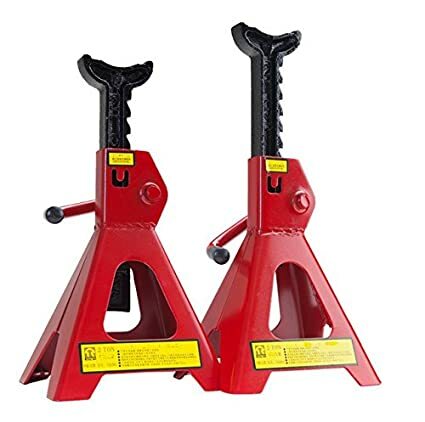 Some consumers are under the impression that a huge, lifting range is the hallmark of a quality jack stand. This concept isn’t necessarily correct. You want to pick a stand that has at least 5 or 6 inches of movement. Try to use the stand at its midway, lifting point. You’ll have the best stability when you don’t choose the highest point on the stand. Only select a stand that has a tall height when you have a particular application, such as a lifted truck. Use caution while the vehicle is lifted so high too. Regardless of your experience with cars and jack stands, a new product should always be handled with caution. Lift the vehicle, and carefully lower it onto the new jacks. Ideally, you should have at least two stands underneath the vehicle. This strategy creates a level area for you to work underneath the car. Read the products’ instructions as you use them for the first time too. Each stand has slightly different specifications. When you’re accustomed to the products, you can use them with ease during each project. Always handle them with care, and they should serve you for many years.